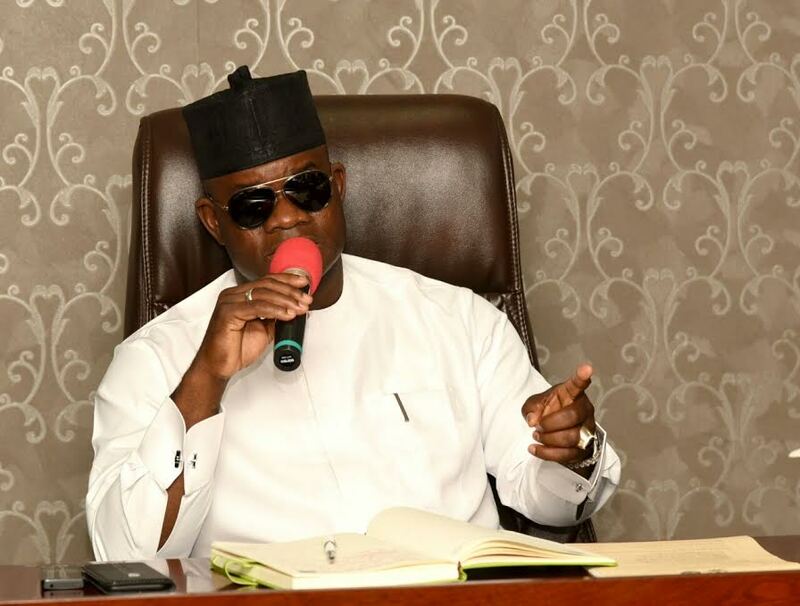 Kogi State Governor, Yahaya Bello has warned the All Progressives Congress (APC) against the opposition party, Peoples Democratic Party (PDP), ahead of the 2019 general election. Bello while speaking during the dinner with President Muhammadu Buhari and youth political appointees at the Presidential Villa, Abuja on Thursday warned that the PDP was not a pushover that should be taken for granted by the ruling party in the forthcoming election. According to him, the APC needed to aggressively publicise President Buhari and the numerous projects of his government in the last three years to Nigeria if he must remain in power after 2019. He warned that the issue of perception must be taken seriously by the APC to ensure that no chance was given to the opposition to return to power in 2019. He said “All that the crooked PDP is offering Nigerians is that corruption is better than incompetence in quote. 2015 was about change, 2019 will be about progress. As members of the APC, we will not deny that our party has a huge task in the 2019 general elections, the election will never be a walk-over, the PDP will not be a pushover. “And we must take nothing and no one for granted. If we cannot defeat PDP, maybe we should not be influencers or we should not even go to politics. “President Buhari is a good product we know, but we must go out to sell him to Nigerians. Perception is very critical in times like this. If we fail, God forbid, the ugly narrative of PDP will overtake the land. “Our scorecard is very rich and very rich enough. We must market the incredible accomplishments of Mr. President and of his administration to every voter and in a language he or she understands. “If we fail, God forbids, the adverse narrative being put out by the PDP and another propaganda machine will dominate the land and shape perception. “If we don’t market our product very well, a tough and progressive victory against a terrorist threat which continues to cost the lives of our brave military and law enforcement agencies will be mistaken for inactions.If we don’t market our product very well, try our political exposed offenders using long extant laws which previous leaders were not willing to deploy against cronies, accomplishments will be mistaken extra-judicial measures and disdain for the rule of law. He, however, added that things will become worse in Nigeria if PDP regains power in 2019. “The worst thing we can do to this country Nigeria is to allow PDP to come back to power in 2019. It is the worst thing we can do to Nigeria. “I will liken PDP to a lion that has been put in the cage for a long time. I have interacted with their members and I know how hungry they have become because they don’t see free money as before. “If we lose this lion again in 2019, then Nigeria is going to walk more than 1,000 steps backward. Like we always said in those days we lost elections, Mr. President will always get eleven to twelve million votes whether he operates from a party or not. That’s how goodwill we had that time.But that is because a lot of people believed that by Mr. President’s integrity and his anti-corruption, he is going to do magic when he resumes office as President. That in two months, Nigeria will change. They don’t know how it would happen. “But the truth is that most of these have been disappointed because they didn’t see the magic. That is why we need to do the real work,” he added.